Solar Panel Maintenance Cleaner – Increases output and watt peak. Compatible – Will not harm the solar panels, aluminum rails, racking or epoxy. Biodegradable – Free of solvents, phosphates and chlorine. Environmentally friendly. pH Neutral – Non-caustic and non-alkaline for safer skin contact. Safe – No solvent content, no volatile organic compounds (VOC). Rinses Clean – No hard water spotting. Deionized water is not required. Use less Water – The effectiveness of SPW means that soil is removed more efficiently than water alone. Easy to Use – Mix with fresh water or use our convenient bottle with sprayer. A 2011 study by the World Academy of Science, Engineering and Technology concluded that “accumulated dust on the surface of photovoltaic solar panels can reduce the system’s efficiency by up to 50%.” Other contaminants can be even worse. Panels must be cleaned for optimal performance. The small cost of regular cleaning with a specialty solar product yields big savings by increasing panel output. Solar Panel Wash (SPW™) was specially formulated to be compatible with the films that are used on solar panels. It cleans all types of solar panels without oxidizing or abrading aluminum rails and mounting apparatus. Many common soaps used for washing cars or windows contain alkalines that promote oxidation and require deionized water for a spot-free rinse. 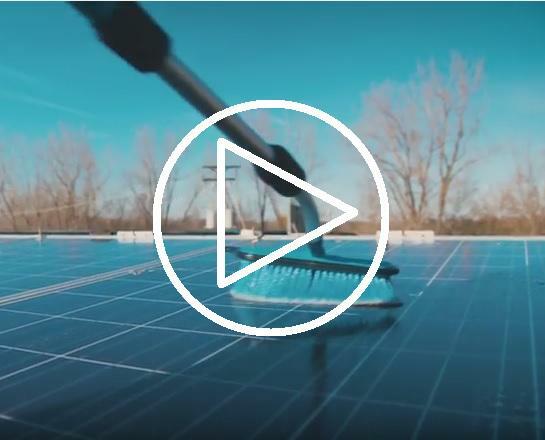 Dust, bird droppings, pollution, pollen, tree sap, plant matter residue, etc., all reduce the overall effectiveness of solar panel generation capacity. Solar Panel Wash has been approved by SolarWorld, America’s Largest Solar Manufacturer since 1975. We have also received an approval from Canadian Solar who is one of the three biggest solar companies in the world by revenue and 4 additional panel manufacturer approvals. Along with manufacturer approvals we have testimonials from end users describing how pleased they are with the performance of SPW™. Please see the sidebar for these approvals and testimonials. Get the maximum output from your panels with American Polywater’s Solar Panel Wash. Recommended dilution ratio is 1 part SPW™ to 25 parts water (25:1). For heavily soiled panels use a higher ratio of SPW™ to water. 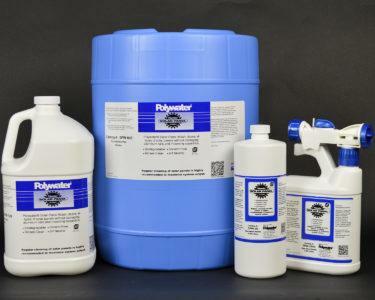 The quart bottle with the hose sprayer attachment is a convenient package for the Polywater® SPW™ Solar Panel Cleaner. When the hose is on, the cleaner is mixed with the water at the appropriate concentration. The cleaner feed can be shut off for plain water rinsing.